In affirming the Bank’s ratings, Moody’s Investors Service affirmed the A3 and Prime-2 long- and short-term deposit ratings, A3 long-term issuer rating, Baa1 subordinated debt rating, and baa3 standalone and adjusted baseline credit assessments [BCAs]. Moody’s also affirmed Butterfield’s A2[hyb] government-backed preferred stock rating and long- and short-term Counterparty Risk Assessments [CR Assessments] of A3[cr] and Prime-2[cr]. Moody’s said the “outlook change to stable was driven by Butterfield’s stronger capitalization following its new common share offering completed on 21 September 2016, which raised its tangible common equity ratios and hence its capacity to absorb losses. “The reduced concentration of ownership stakes held by 2010 recapitalization investors including The Carlyle Group private equity funds to about 28% from 47% was also considered in the outlook change, as it results in a more diversified public market ownership of Butterfield’s shares, adding stability to its shareholder base. “The new share offering totaling $250 million represents Butterfield’s debut listing on the New York Stock Exchange in addition to its listing on the Bermuda Stock Exchange. “The net proceeds of the offering to the bank totaled around $127 million, adding approximately 250 basis points to Moody’s tangible common equity [TCE] ratio for the bank to approximately 15% as of 30 June 2016 [before dividends at the close of the deal]. “Moody’s expects this ratio to remain in the range of 13%-14% over the outlook horizon, as Butterfield plans to use some of the proceeds from the issue to redeem its preferred stock. 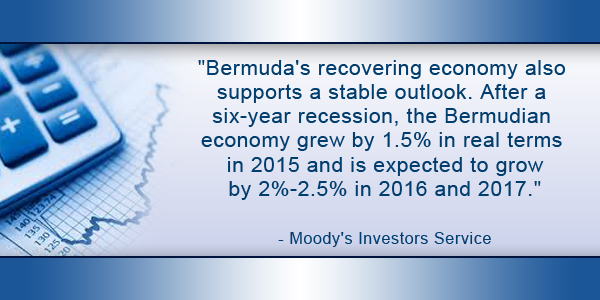 “Moody’s also said that Bermuda’s recovering economy also supports a stable outlook. After a six-year recession, the Bermudian economy grew by 1.5% in real terms in 2015 and is expected to grow by 2%-2.5% in 2016 and 2017. “Butterfield’s problem loan ratios have been declining since 2012 and the recent improvement in the economy should lead to firmer asset quality. Moody’s noted, however, that Butterfield’s key credit challenges continue to be its risk concentrations in Bermuda real estate and still-high level of problem loans relative to peers. “Moody’s stated that the recent improvement in asset quality has resulted in lower provisioning costs for the bank. “Moody’s also expects the bank’s core profitability to continue to improve, given management’s focus on increasing fee income and reducing operating expenses through the transfer of back office operations to lower cost jurisdictions and the divestiture of non-core businesses. Butterfield Bank Files For Proposed IPO In U.S. The apparent expectation by Moody’s that real (inflation-adjusted) growth in our economy will be 2-2.5% in 2016 seems rather optimistic. Indeed, we may quite possibly have already slipped back into recession, depending on what the second-quarter Gross Domestic Product results for 2016 turn out to be.